Enjoy surfing in Greece windiest places. Join Kitegreece in learning to ride the steady meltemi wind available all day long. 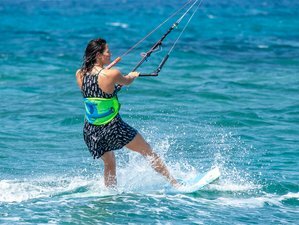 Experienced Instructors, designated swallow water area for our students, private facilities, ideal weather conditions, and the latest equipment make Marmari a perfect destination for both learning and practicing kiteboard. You will be staying in a studio in a kite villa, Marmari. The kite villa is on the seaside street, 200-meter before the Royal Sands Marmari Surf Club, and is sea front. It has five studios for three people with one double bed and one single bed and one two-bedroom apartment. All studios and apartments have a fully equipped kitchenette and a bathroom with a toilet. It is only one floor building. Since 2006 Kitepark offers high quality services to the Greek kiteboarding scene. Kitepark is the only organized school on mainland Greece. Experienced Instructors, designated swallow water area for our students, private facilities, ideal weather conditions and the latest equipment make Kitepark a perfect destination for both learning and practicing kiteboard. Despite that Evia island is a perfect multi activity destination, it’s also one of the windiest places in Greece. Due to its geographical position it offers unique wind conditions all year round. Especially from March to the middle of October the main spots offer kiteable wind conditions every day. The wind strength varies from 15-35 knots and the water conditions from small chop to flat to mid size wind swell which creates waves 1-2.5 meters at certain spots. Big sands Marmari Surf Club is one of the most guaranteed wind related destinations in Greece. Due to the shape of the mountains surrounding the village of Marmari and the small straight in between Euboea island and Petalios islands which create Venturi effect. It mainly works with Meltemi (northern) wind. You can expect winds from 15 to 35 knots. So, 12 to 7-meter kites would be a good choice but mainly nine-meter is a good size. The spot also works with South, West, and North West winds. An important note is that Karistos which is the biggest city in the area and 10 minutes drive from Marmari offers a 20 kilometers coast line with beautiful blue waters and nice waves when south winds blow. This kitesurf camp by Kitegreece includes 10 hours of semi-private kitesurfing lessons for a minimum of two-people. The lessons are usually separated in two hour sessions. The most common practice is two hours in the morning and two hours in the afternoon. All equipment is included. The kite spot in Marmari is with steady Meltemi wind from mid June to end of September, coming side shore. Please note that the daily program is according to the wind and the other bookings. This surf camp will take place in Royal Sands Marmari Surf Club in Marmari, Greece. Royal Sands Marmari Surf Club is situated in the South of Evia or Euboea Island the second biggest island in Greece and the fifth in the Mediterranean Sea. Big Sands Marmari Surf Spot is a spot of unique beauty and unmatched wind conditions. The surf center is located on the beach and just five minutes drive from the small fishermen village of Marmari. In front of the center is a big sandy beach with plenty of space to set up your equipment and land/launch your kite. Highlight of the spot is the amazing sunset and the view to Petalios Islands complex. The little village of Marmari in the south of Euboea is a tourism destination recently discovered by European surfers who mainly want to relax in a quiet multi activity destination, enjoy fresh and delicious greek plates and pure nature. Night life in the area of Marmari is not one of the favorites but there are a few bars that play international music and serve fresh made cocktails. In Karystos, which is 15 minutes drive from Marmari, there are many bars and plenty of people both tourists and locals that party till the sunrise. No meals are included in this package. Marmari is a traditional Greek village with great taverns, cafes, bars, and is famous for the local Greek food so full board or half board stay is not recommended.